Jack and I recently headed out to West Texas for a multi-day adventure. We left Austin on November 10th and returned November 15th. Our plan was to do a few short hikes, little backcountry driving, and finish with backpacking the Outer Mountain Loop. We also met up with our Dad (Bmo) and Jonathan (cousin) for added excitement and fun. Check out Day 3, Day 4, and Day 5&6. Elevation: 1,800 to 7,832 ft.
Big Bend National Park is part of the Chihuahuan Desert and covers 801,163 acres (the 14th largest National Park in the US). The park is in West Texas “bend” and the southern boundary is the Rio Grande. 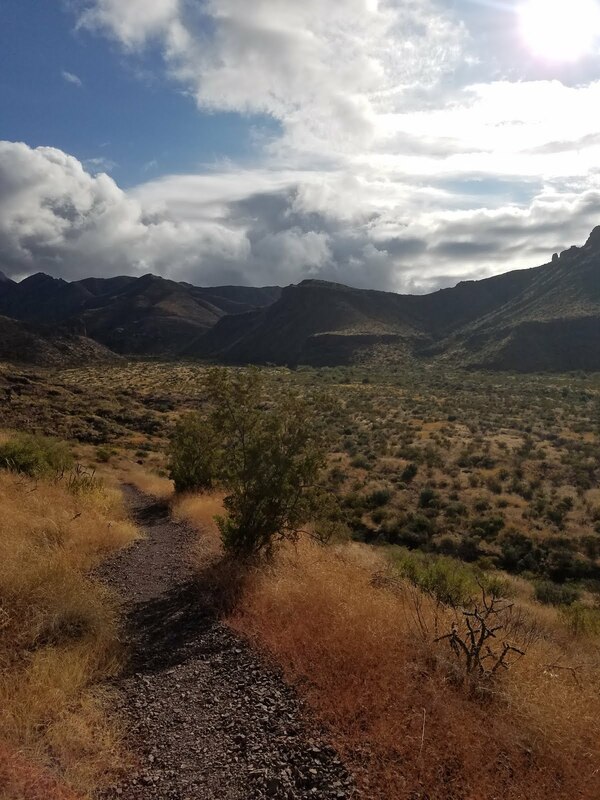 The area is home to an extraordinary amount of desert flora and fauna: 1,200 plant species, 3,600 insect species, and 600 animal species that survive in the arid scrubland environment. Jack and I woke up at 5:00 am on Thursday morning because we wanted to arrive early enough to beat the Veteran's Day crowd. It didn't take us long to finish packing all our gear in the car and we hit the road about 20 minutes later. This is the longest road trip we’ve ever taken to make it to our adventure location. The total drive time was around 8 hours with gas stops. 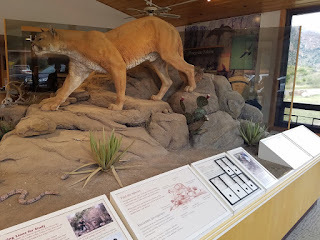 Once we finally made it to the park, no one was manning the small entrance booth, which required us to make a quick detour to the Persimmon Gap Visitor Center to register the vehicle. After that, we headed straight to the Chisos Basin Visitor Center to score a campsite and work out our backcountry trip. With first stop at the visitor center, the news was quickly broken to us about areas of the Chisos Mountains were shut down due to bear activity. This news disheartening and our Outer Mountain Loop backpacking plan was derailed within an hour of entering the park. Hearing the bad news, we decided to go pick out a basecamp in the Chisos Basin campgrounds to give us an opportunity to regroup. At the campgrounds, we picked a decent campsite (close but not too far from the latrines) but decided to give one last walk around before committing. While searching, we actually found a better spot, but a guy in his large truck pulled up to the campsite and drove over a large rock, which scratched and scraped up his vehicle. He then rolled down his window asked if we were going to take the campsite. Sharing an awkward moment, Jack and I felt so embarrassed for the guy we just let him have the campsite and quickly walked back to our original site. We unloaded our gear, set up our tents, and paid for the campsite in no time at all. With everything in order, we then had a quick brainstorming session about new possible routes and decided we should go talk to someone with a little more knowledge. 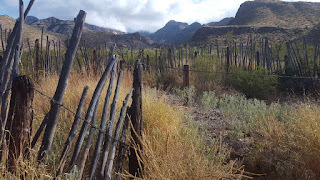 On the way back to the visitor’s center, we saw the sign for the Chisos Restaurant and of course we decided to stop for a quick bite to eat. The Chisos Mountains Lodge Restaurant and Patio has the advantage of being the only place serving food in the area, which means it also has a limited selection, but at a surprisingly reasonable price. Jack had a burger and I had the enchiladas, and after finishing our meal we headed back down to the visitor center. Thankfully, there is a large wall-sized trail map available and we were able to look at that while talking possible routes with one of the park employees. Receiving some great helped from experienced staff, we decided on a new route and copied the backcountry grids to help speed up the process of getting our permit. Our new route: starting at Mule Ears, heading west on Smokey Creek Trail to Dodson Trail for day 1, Dodson Trail to the half way point on Elephant Tusk Trail for day 2, and backtracking on Elephant Tusk Trail to Juniper Canyon Trailhead for pick up. Feeling a little better knowing our trip wasn’t completely derailed, we headed back down to our campsite and linked up with Jonathon shortly after that. Still waiting for Bmo to arrive, we decided to hike the Window Trail. Window Trail is about 5.5 miles and parallels Oak Creek Canyon. To our surprise, Oak Creek was flowing and we had to cross over it multiple times, which is a little scary because the rock is incredibly slick when wet. The trek to the "Window" is well worth it because the pour-off provides an amazing view of the surrounding area. The hike allowed us to warm up for the upcoming days and catch up with family. We made it back to the campsite and Bmo finally arrived and was unloading his gear. We helped him set up his humongous 4-person tent, which took a bit of effort/critical thinking, and his giant cot. To repay everyone for their kindness he cooked some pretty amazing burgers for dinner. By this time, it was fairly late and everyone headed off to bed a little later. 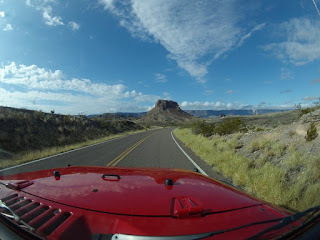 We had another early morning so we could make it into Terlingua to grab breakfast and pick up the Jeep we rented. We woke up and it was raining pretty hard for a desert environment, which helped ensure everyone got ready hurriedly that morning. Before stopping at Far Flung Adventure to start our jeep adventure, we had a buffet breakfast at Big Bend Motor Inn Store and Restaurant. The breakfast reminded me of food from an Army chow line, but it was filling and got the job done. Once at Far Flung, they handed the jeep quickly, the benefit of filling out all the paperwork beforehand. We all loaded up and stuck Jonathan and Bmo in the back and they instantly had an issue; they had no clue how to roll down the window. With that problem solved, the window controls are in the center dash, we were off towards Homer Wilson Ranch to drop off our water. After just a short bit of driving, 2 issues quickly became apparent, one of our water jugs completely drained/spilled everywhere and Jack was rusty at being a navigator. We ended up needing a few map breaks and a U-turn before making to Homer Wilson. Finally there, we walked about a fourth mile to the metal bear box, which was our first water cache point. After that, we decided to walk the next .25-miles to the Home Wilson Ranch, where we wandered around for about 15 minutes. Back on the road and needing a water refill, we headed to the had to travel to Castolon Visitor Center as it was the closest possible water option near us. We explored the area and found old farm equipment and asked in the center, which used to be a post office, if water was available. The clerk directed us to the Castolon Campsites just down the road. A few minutes later we were Castolon campsite for a water refill and the area was so green, I thought we were on a golf course. And we were off and on River Road West. Of course, the water jug began leaking minutes in. Bmo was able to twist around and hold the jug until Jack could make it out of the jeep and remedy the situation. The final damage was about 25 percent water leaked again, but we decided there was enough water between the regroup to refill the bag. On the road for a while, we took our first pit stop and used the opportunity to take a few pictures. We were surprised with an old rusted our car on the side of the road, which reminded us all of a scene from the Fallout game series. We spent the next few hours driving over amazing ridges, across gulleys, and down dry creeks. 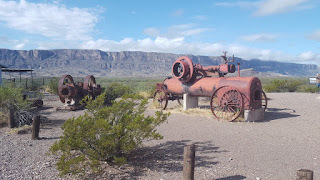 While it doesn’t make a good story, the views are spectacular and I recommend everyone try driving some of the back-country roads in Big Bend National Park. Old car on River Road. Does it remind anyone else of Fallout? 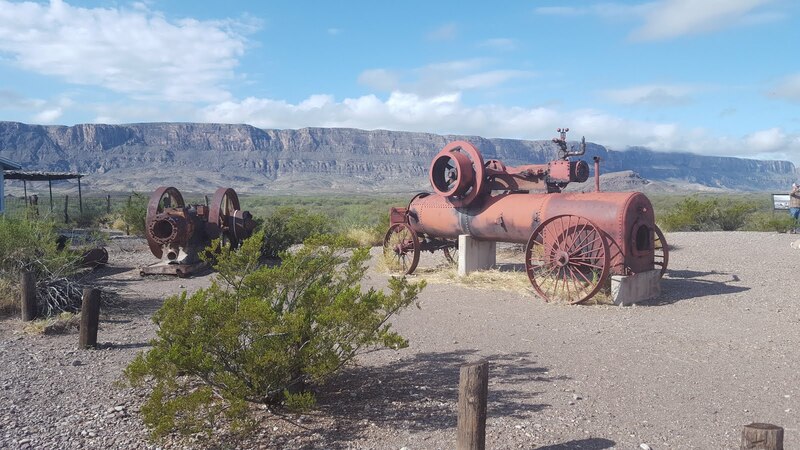 Another remarkable location on River Road is the Mariscal Mines, which we decided was worth the time to stop and explore. The mines are a source of cinnabar ore, which was refined into mercury and was in operation until the 1940’s. There are multiple structures to explore and the old mines are still available but are blocked off for safety (thank goodness for that because I would have climbed in there for sure). As the sun began setting, we made it to Glenn Springs Road and then on Juniper Canyon Road, which was a much rougher ride than anything else we experienced. We drove almost completely down Juniper Canyon Rd, we stopped at Twisted Shoe campsite because we thought this was the last cache box. 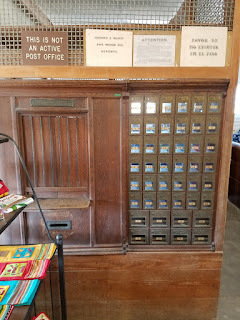 A nice older man already set up at the location said he’d be happy to share his box with us and the let us know there was another cache box at the actual trailhead. With our water safely cached, the group began the trip back to Terlingua to drop the jeep off. We dropped Jonathon off first and the headed off for gas and a poor jeep clean up job using a window squeegee. After dropping off the jeep, we decided it was time for dinner and a Mexican food restaurant was just next door. Unsurprising, their credit machine was down (connectivity is poor in this part of the state) and the waiter said the liquor store just up the road had cash back available. Jack and I walked to the liquor store and began looking for something we might want/cheap booze. 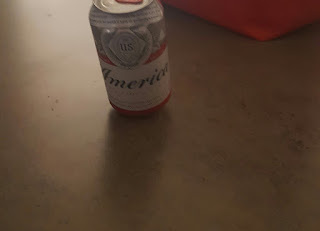 I located a bin full of busted Budweiser cans with a sign stating they were discounted. I grabbed a can and asked for max cash back. That stupid can cost like $3 and was a horrible deal, I should have gone with a Forty. That beat-up Bud can is still just sitting in my apartment, shockingly no one will drink it, so if you want a Big Bend Bud can souvenir let me know (maybe January’s giveaway?). Finished with our liquor store misadventure, everyone opted for enchiladas, which was a satisfying meal. Finally, back at basecamp Bmo had a horrifying discovery. The inside of his tent was drenched as well as his sleeping bag. The decent mountain rain had pooled on the top of his enormous tent and slowly leaked through a hole all day right above his sleeping bag. Jack and I were powerless to help him, but luckily Bmo had a backup blanket. With everyone tired from a long day, we were off to bed. Bmo ended up sleeping in his truck for a little extra warmth and Jack and I went to our tents where I recorded the day’s events before falling asleep. I'm glad you enjoyed it and if you want that Bud, I will let you have it!